At 3DPI, we’ve covered a plethora of stories in which doctors have created 3D prints from the CT scans of their patients. We’ve even covered one story in which a husband did so for his own wife. But what about lil’ ol’ you? (Sorry I called you ‘little’ and ‘old’.) Make recently published a post on how anyone who has undergone a CT scan can have it 3D printed. Author of the post, Luis Ibáñez, begins his post by explaining that the HIPAA act allows any patient in the US to obtain a copy of a CT scan they’ve had performed, for a reasonable reproduction and mailing fee. For creating a 3D print, Ibáñez instructs you to request the 3D DICOM data of your scan, specifically, which should be delivered to you on a DVD within 30 days of request. 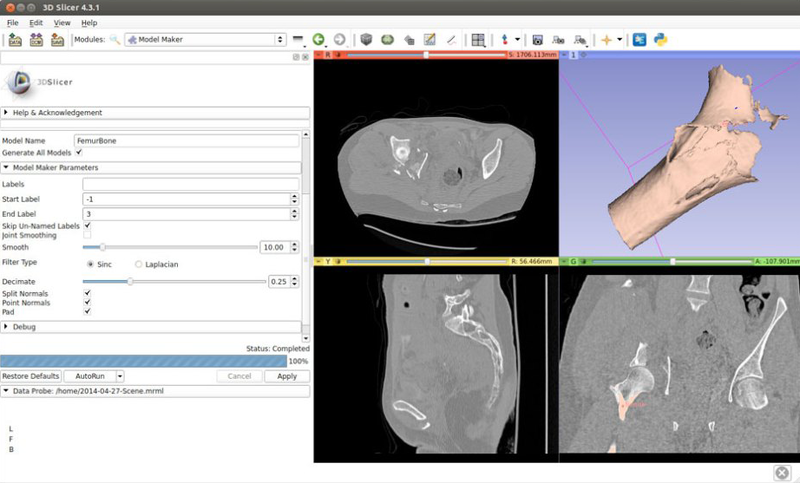 The next step is to get your hands on some open source medical imaging software, like OsiriX and 3D Slicer. Ibáñez then goes through the process of using 3D Slicer to take DICOM data, made up of individual scan layers, and fuse it together. The process is not an easy one, as it involves image segmentation with what may be some hefty open source software. The author, a Google engineer, describes image segmentation as “a mixture of art, science, and a bit of black magic (read “parameter tuning”).” Head over to Ibáñez’s how-to to get into the nitty gritty of connecting these slices for 3D printing. If you can stomach the black magic, you’ll be ready to export your model as an .stl for clean up in Meshlab. Then, it’s off to the printer. Now go out there and save some lives!